2018 – what a year you have been. You have been shaking the earth beneath my feet and jiggled me down to my bones. You brought me onto my knees and turned my life upside down. Feeling lost and raw, fragile and shaken, like a surfer without a board. When the floor has been pulled from under your feet, it feels scary. But we adapt, catch another breath, find another way, falling and getting up. Just like Emahó – my brightest light and most amazing guide – used to say: no matter how often you fall – and you will keep falling – the only question is, how you get back up. And thats the “spiritual warrior” – hunting down the goodness, when life is not only rainbow unicorns in a pink sky. So 2018 started of at a beautiful tropical beach, dancing and enjoying life, almost with rainbow unicorns in a pink sky. I was excited and convinced that this will be a year to joyfully unfold my womanhood and to celebrate life in its juiciness (and not just work). And yes, the portals opened up and I could glimpse the gem behind. However the opening was rather harsh then juicy and far away from – you know unicorns, pink skies. Although I knew something “big” had to happen, I was afraid to pay the price. So, my partner and I split up. Finally – after 21 years – BANG !!! Sure the two decades haven´t been easy and we had our struggles along the way, no doubt. And YES, we were stuck for quite some time. But we also were partners and good friends and family, so you can imagine what kind of big thing this is. Despite the pain and questions, despite the fact that I had to find another place to life, despite the tears and the regret, I knew I am okay, I knew I will get back up. And I got back on my feet, like most of us do, but we tend to forget. This “BIG BANG” has been a real life changer in many ways. I had to look at so many things and ask myself so many questions – like where do I want to live? 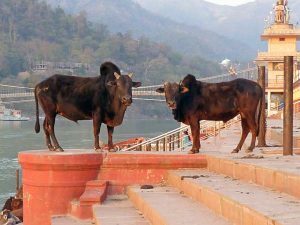 Shall I stay in Rishikesh, my beloved indian home? Shall I go back to Berlin? Or shall I move to Greece or somewhere else and start from scratch? And then this troubling thought/believe/fear of not having the energy to start again. I have been self employed my whole life, changed careers twice, moved to another country, starting all over again. I know what it takes and I felt overwhelmed. Decisions had to be made, actions needed to be taken – all in alignment with my inner and outer state and with my future to come. It took time and energy. And a great deal of support from the universe in form of students, strangers and friends. In these times friends – old and new ones – are a such blessing. Relationships were deepened, and especially the relationship with myself! It is kind of embarrassing to admit, but I did struggle with the idea of turning fifty AND being single. The fear creeped in, that my life as a woman might be over. I even felt challenged by the plethora of young juicy “insta-yoginis” running the show. I questioned everything: my past, my relationship, myself, my teaching, my offers, my place in the world, my home, my purpose, my future. Its been troubling at times and I had to leave aside some projects I wanted to bring to life – such as – working on a book to inspire you, creating online courses to support you, leading more retreats to share with you, showing up more, learning more, connecting more, reaching out more. Do you feel it? Haha, of course 2018 has been a year of less, of doing less, of slowing down, of reflecting, of taking time. And I did. And I had a great summer. And I discovered whole new ways to relate, to care and to love myself. So, here are some highlights of this journey that I am deeply grateful for. May they inspire you! MAMA INDIA welcomed me, colorful and heart warming as ever, starting off leading a nurturing yoga & ayurveda selfcare retreat. I was blessed to spend a month in my beloved Rishikesh and to share the amazingly transformative vibrations with our sweet community, embraced and cared for by our indian family, by mother Ganges and the Himalaya. Yoga at its birthplace still is the best! In between I travelled through other stunning places, where my yoga student and talented photographer Lea and I created an impressive volume of awesome pictures for our Yoga Inspiration Book. Although I didn´t write the book – yet – I successfully signed contracts with some well known yoga-magazines. CONGRATULATIONS, we soon gonna publish some articles for you. And Lea, thank you thank you thank you – your work is great! Back in Zürich I have been lucky to build myself a beautiful new home for the next cycles to come. Its been a process of envisioning the future and clearing the past, as I also remodeled my old Berlin artist flat – letting go off stuff, relocating and decorating is such a good Detox Yoga – did you know that? I faced my failures in my relationship and saw and accepted the karma behind. I appreciated the time we spend together (even far too late), and acknowledged the roles we played in this cosmic dance called life. 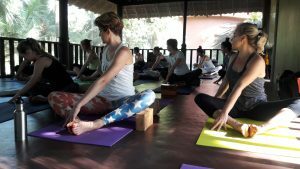 And AHHH, how did I enjoy the privilege to guide a unique group of fabulous woman transforming into beautiful Yoga teachers – Thanks to all of you wonderful ladies: you were amazing to work with – such deep sharing, such growth, such caring. I also promised to take care for myself. So I went off to meditate, took some seminars, read some books and researched some trainings. I went to swim, enjoyed an epic summer, had loads ice cream, jumped of the bridge. 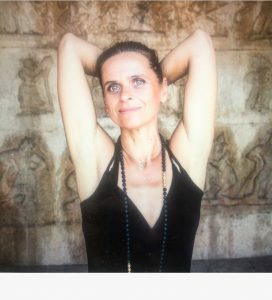 Over the course I slowly started to redesign myself as a woman, as a yogini, as an entrepreneur and set the path for a new career. I said NO to quite some things and YES to life. I went for an adventure despite concerns and fears. I tried something new, that didn´t seem to make much sense and found that this was the perfect thing in the end. I fell in love with Japan and made new friends. I turned 50 and had a wonderful, exceptional day. I woke up the next morning inspired to start my new life. YES, I can say I feel excited and empowered for what is coming up. I navigated my life into a new direction and surrendered myself to keep learning, exploring and unfolding. And I found the courage to share this with you and all the stuff, that maybe no one wants to hear. Life has been my guru and yoga has been my saving, my anchor to root, to clear, to re-align. 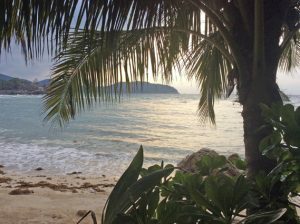 I thank my past and welcome my future – life never ends, embrace yourself – embrace life! Hey, I would love to hear about your journey too. So feel free to leave a comment, to send me an email, to join a class, a retreat, a training and simply get in touch. Dear Diana, it’s magic when from sorrow a spring arises. A loss is also an opportunity (for a new experience, for redirecting, for reflexion, for a turn). The past always pushes us lovingly further ahead. It doesn’t hold us back. Therefore we can loose grip! Openhearted people like you that spread so much humanity and warmth will always be free and embedded at the same time. And yes, I talk about you as the best yoga teacher ever. All the ‘insta-yoginis’ put together can’t make up with your spirit. And yes, your softness and uncertainties complete the beauty of a real woman. So we have plenty of reasons to stay confident. thank you so so much for your inspriring and comfronting words.I know that you know about loss an di admire you for your courage to face real and definite change. so nice to have peopel opening up and learn form them. And yes life wants us to grow and even thrive and has its unique ways to push us forward. its a dance and I am glad that i can dance it with some kind spritis like you.